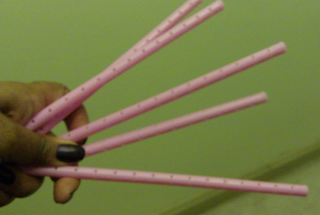 I purchased Strawllers a little over a year ago (as a permie) because I wanted to have an alternative to using the less expensive way to put spiral curls in my hair-which is using regular drinking straws or using heat. 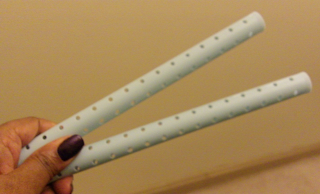 I came across Strawllers after doing a Google search for straw rollers and magically appears these rollers! I was so excited to get them. I browsed through the entire site and made my purchase. I couldn't wait for the package to arrived. I got it within a matter of days. Now I had experience with regular sized rollers but was a little challenged by the actual length of the Strawller. One problem I encountered was the fact that I have thick hair and I didn't purchase enough when I thought I did. Problem two was I made due with what I did had, strategically rolling my hair to where I could use a curling iron for some missed spots. Problem three...you cannot sleep in them. Now regular rollers you can, though a tad bit uncomfortable you can manage. These rollers although a great invention works best in a salon setting and rolled by a stylist. Now if you purchase a lot of them you can probably get your girlfriend to roll your hair and you have to sit under a dryer or be stuck with them for a day until your hair dries. While these aren't completely user-friendly for the average Glow Girl, unless you're one heck of a roller. However in the right hands, your hair can look fabulous. My honest option, drinking straws are the easiest way to go. They're flexible, plentiful and inexpensive. Unless they develop a way for the roller to be a little more flexible-leave Strawllers to a trained professional. Its funny you did this post because I was JUST thinking about getting a straw set, but I have a lot of hair and I can't imagine doing these myself. And I'm almost sure the salon is gonna charge me an arm & a leg to do these but I think its worth it, especially if they last. I'm gonna try it out really soon! ( at the hands of a professional of course) LOL! LMAO!!! Is this the Erica I know??? If so, can I throw in a 12 pack of blue sharpies for an extra curl in my sideburns? i'll even do some....BABY HAIR TYRA STYLE! No ma'am. 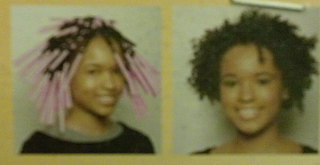 In that pic I actually used sponge rollers...it creates the same effect like the Strawllers but not as smooth.